We have C&O corporate Annual Reports for the years 1910 through 1979. This is a collection of letter files that was kept by the C&O’s Chief Engineer’s Office in Richmond, VA. 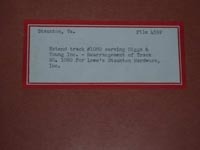 These files contain mostly correspondence to and from the Chief Engineer’s Office to and from other C&O officials at different locations all across the C&O system. All of the correspondence relates to various building projects that were underway from the early 1930’s to the late 1960’s. The files also contain copies of engineering drawings that relate to each individual project or file and are organized using a numerical system exclusive to the Chief Engineer’s Office. These files are designated in the C&OHS Archives Database by the “Collection” notation: “CELF” (for Chief Engineer’s Letter Files.) These files are partially indexed in the online Database and there is a partial card file index located in a card catalog upstairs in the C&OHS Library. The files are 80-90% organized and cataloged. Each division on the railroad has a Division Engineer, responsible for the operations, construction, and maintenance of the railroad within his division. This collection of office files are paper files that came from the Clifton Forge Division Offices that were located in the Clifton Forge, VA. The material contains numerous transportation and engineering department files. The C&O Railway merged and otherwise acquired many corporations over time. We have corporate records for many of the predecessor companies of the C&O Railway dataing back to the 1800’s. This is a collection of office material and paper files that came from the Hinton Division Offices that were located in the Hinton, WV passenger station. The material contains numerous transportation and engineering department files. This is a collection of office material and paper files that came from the Potter Street Station in Saginaw, MI which was the headquarters of the Pere Marquette’s Saginaw Division.